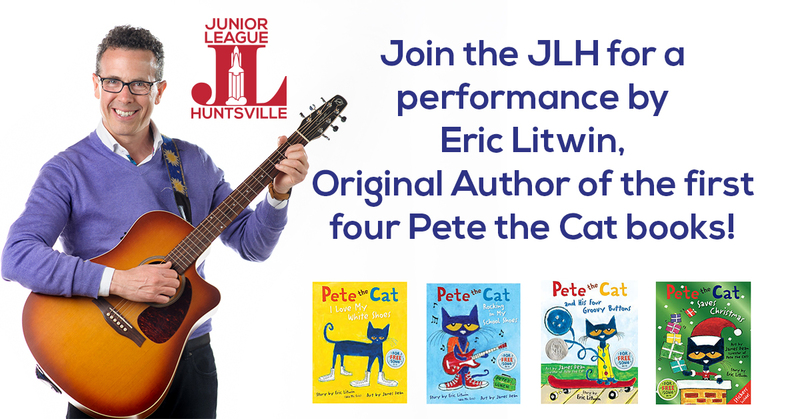 Join the Junior League of Huntsville on April 7th for a fun day filled with exciting activities including a book-signing with Eric Litwin! Eric Litwin is a song singing, guitar strumming, # 1 New York Times Best Selling author who brings early literacy and music together. He is the original author of the Pete the Cat series as well as the author of The Nuts and Groovy Joe. Eric’s books have sold over 10 million copies, been translated into 15 languages, and won 19 literacy awards including a Theodor Geisel Seuss Honor Award. 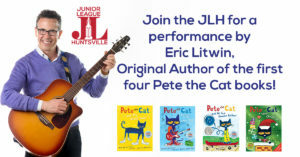 Please note: Eric Litwin will only be able to sign the following books from the Pete the Cat series: Pete the Cat: I Love My White Shoes, Pete the Cat: Rocking In My School Shoes (available for purchase on our ticket page), Pete the Cat and His Four Groovy Buttons, and Pete the Cat Saves Christmas. He will also be able to sign any of the books from his other series, The Nuts and Groovy Joe. Come for a show and join us for the Food Trucks, Face Painting, DJ, and Bounce Houses which will be located on the track open from 11:00 am- 1:00 pm! Tickets are $20 per person and you can preorder or buy at the door. Books for signing can be preordered or purchased at the door. Purchase your tickets for this exciting event today! All of the proceeds from this literacy based fundraiser will be used to support the Junior League of Huntsville’s community impact service projects.